Attach to any standard garden hose to make it way better. This little device is actually a flow control valve, and when added to the end of your hose, or before a nozzle, it will add convenience, and give you way more control. Instead of running back to the faucet each time you need to slow the water, change nozzles, or temporarily halt the flow, you can just use this switch. The large toggle provides a range of control, so easily slide it one way to turn the water off, or slide it the other way to turn it on. You can even stop anywhere in between to control the water pressure as it flows through the hose. The convenient sizing makes it easy to use without being too bulky, and the universal threading makes it compatible with any regular hose you have now. Simply twist it in place to begin using it, and enjoy the time and effort it saves. It's made from a sturdy plastic material that can withstand constant use, and it offers plenty of clearance so any nozzle or tool you have will still fit nicely when paired with this valve. Conserve water by only spraying what you need, and eliminate annoyances like dragging around the hose just to turn down the water. Start using this simple device to make watering plants, washing cars and many other backyard chores easier. Full Control. Turn it all the way on, turn it all the way off, or set the flow at any point in between to get the perfect amount of pressure. Sturdy Construction. No cheap plastic here. This fitting is made with thick, heavy duty materials that won't break or fail with use. Easy-To-Use. A simple thumb flick is all that it takes. Quickly adjust the stream without slowing down. Totally Compatible. 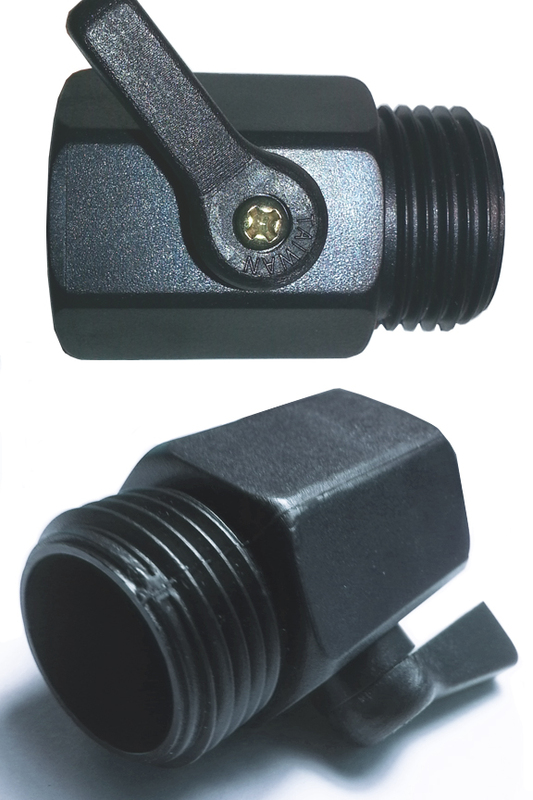 If you have a regular garden hose, and regular size nozzles, this switch is guaranteed to fit. Large Toggle. Smaller switches, or valves that work differently can be annoying. This one offers smooth, effortless operation. Eco-Friendly. Because you will only spray what you need, and then shut it off afterward, you'll end up conserving water and avoiding puddles. It's incredibly simple to use, and when added to any hose, it will make it easier to use, and more versatile at the same time. There are no special steps or complicated installation techniques, and you can use it on any standard size garden hose. Attach at the end of the hose to use alone, or add before a nozzle to add control. To put it on, simply twist to the right to thread on, and tighten in place. To remove, simply turn in the opposite direction(left), and loosen until it comes off. To use it, shift the valve open of closed by moving the long switch. One way will open it up, and pressing the other way will close it. Use instead of the faucet to stop water or decrease pressure and save yourself time and energy. Dimensions 1.25" x 1.25" x 2"
Uses Add to your hose to improve control. Creates an on off switch at the end, or before spray nozzles. Compatability Works with all standard garden hoses. Control Ability On, Off and all ranges in between. Cut the water off with a flick of your thumb. Stop running to the faucet to lower pressure or cut the flow. Get full control of the water at the end you hold. Works with any garden hose. Order Yours Today! Pre-Cut .095 Replacement Line For Your 1-2-Trim Trimmer Head.